A properly maintained Vendor List helps a business in many ways. This is useful for keeping track of all the goods to be imported, estimation of future orders and all the transactions. The debt payments and financial analysis can be done more effectively by maintaining quality Vendor lists. An unmanaged vendor list often results in misguiding information and businesses incur significant losses due to it. 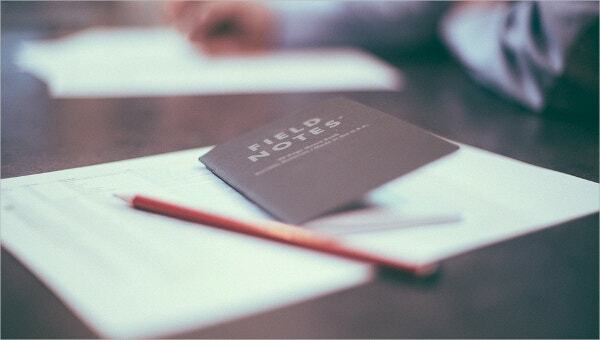 Where there are various ways to keep a record of Vendor lists, we present before you some useful List Templates that will let you gain more control over your data. 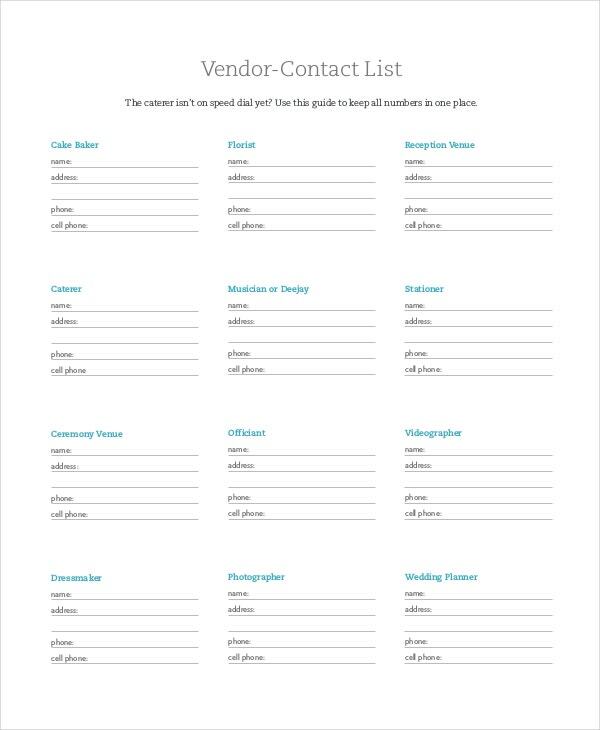 This is a simple yet beautifully organized template that lets you keep all the vendor information like their addresses and contact numbers at one place. Getting the information of all wedding itinerary service providers like Cake shops, Dance Teachers, Event Planners, and Florists is necessary and this fulfills the need amazingly. 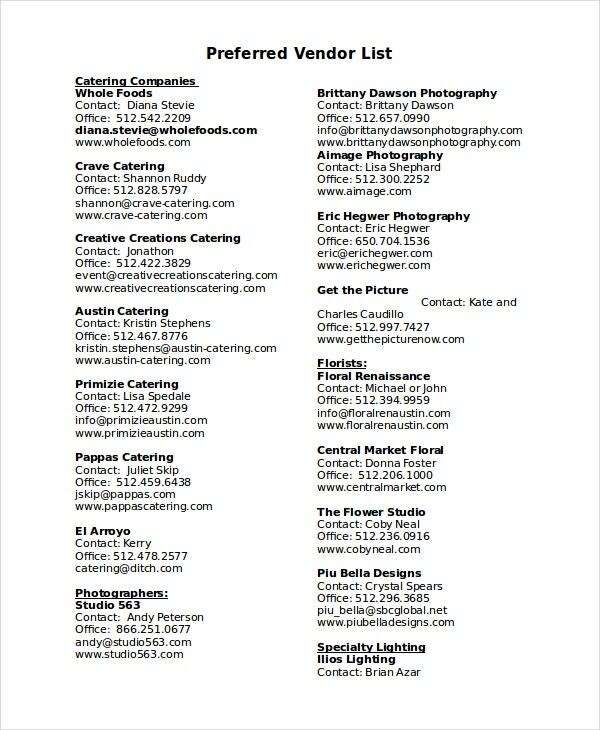 You may also see Contact List Templates. Maintaining and reviewing a master vendor list helps you prevent irregularities and fraudulent activities within your organization. This template enables you to keep a record of important vendors and periodic transaction amounts in one list. It tracks all the single transactions made over a particular period of time which is helpful in financial analysis. 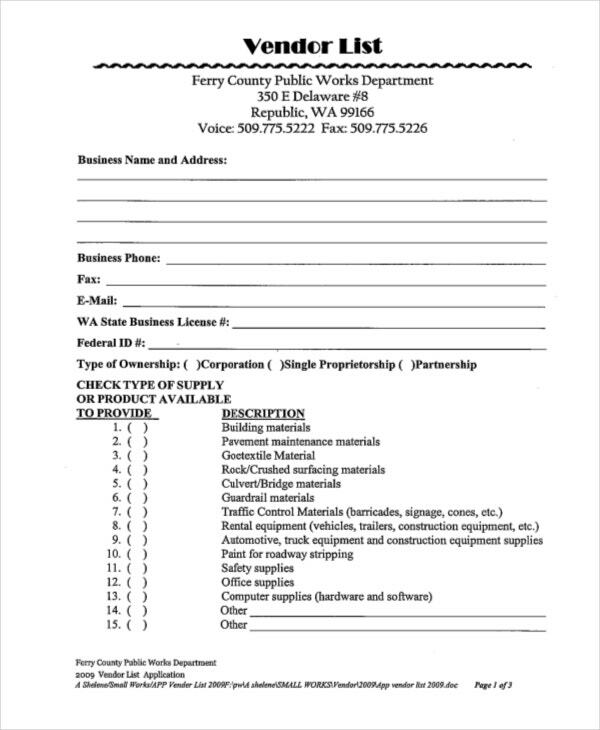 This template can be used to develop an application that you may like to distribute among your prospective vendors before moving to a contract with them. It includes all the necessary fields that let you gather the important information about the vendor. This will, in turn, enable you to evaluate individual applications before the bidding process begins. 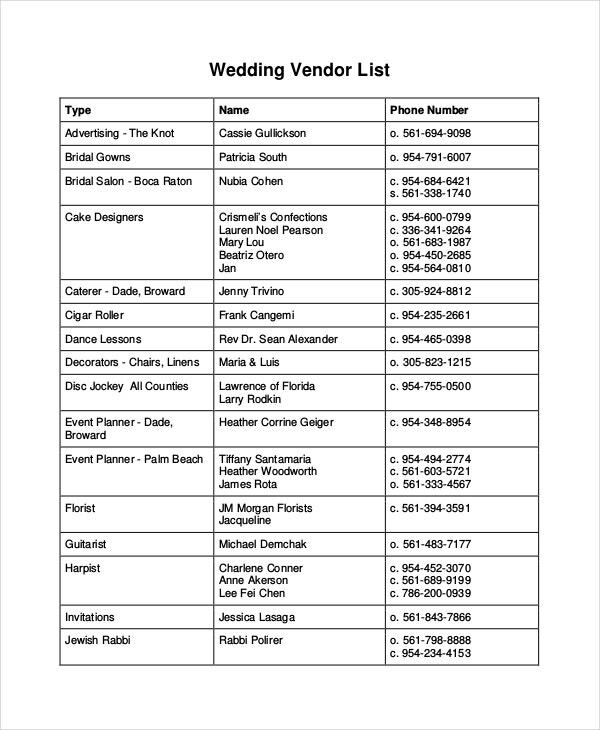 This vendor list is an excellent choice for maintaining information of your preferred vendors. This template looks more like a consolidated version of business cards. All the required information like address and contact number are accessible easily and quickly in this format with a just a quick glance over it. This template is a great format to design your guidelines document that you wish to share with the potential vendors. It clearly mentions the guidelines to be followed and briefs the reader through the procedures lucidly. The design is simple yet powerful as it captures all minute details. 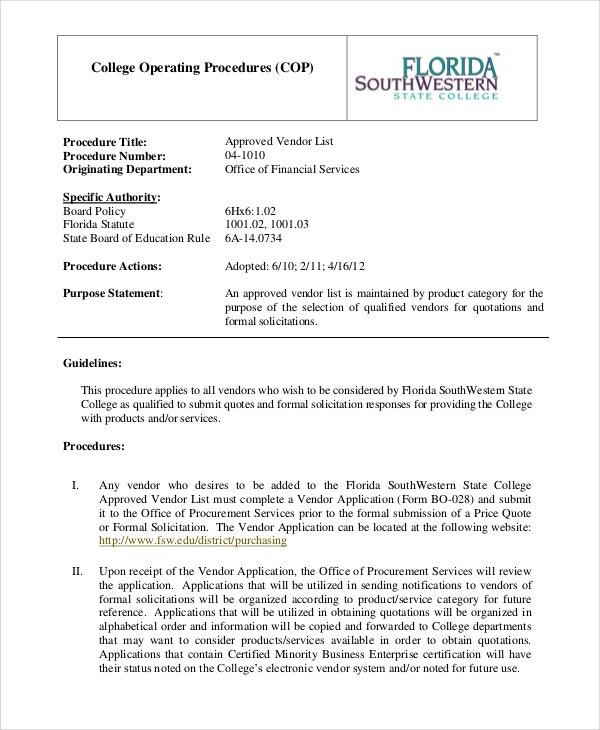 > What does a Qualified Vendor List Mean? A Qualified Vendor List, often referred to as QVL, is a group of pre-qualified vendors who use third party company’s products or services to develop their own product. All the third party product models they use are approved to be compatible with the qualified vendors’ products. For example, an electronic device manufacturer may need to use Integrated Circuit chips that they do not produce themselves. Rather, they use chips which are manufactured by some other companies. The chip company is the third party that approves the compatibility of the chips to be used. The list that contains such electronic device vendors List Templates is an example of QVL. If your business is likely to make repeat purchases, then creating and maintaining a list of preferred vendors would help you in both financial gains and better planning for your business. But a few things need to be taken care of before you come up with a final preferred vendor list. Before listing any vendor in the preferred list, you should conduct an in-depth research about the vendor, its work history and its reputation in the market. After the first round of purchase, evaluate the quality of goods, delivery processes and others factors that you consider critical for your business and once you’re satisfied with the result of your analysis, you can move on to mark that vendor as a preferred one. Once you add any vendor to the preferred list, periodically reviewing the vendor’s performance will be helpful. You can be assured of the quality of goods and price fluctuations in the market will not incur more costs for your purchasing. The debts and other transactions can be handled more effectively. This will ensure a constantly moving business between the vendor and the customer that is beneficial for both parties. We have picked up the best Supplier List templates for you to choose from the lot in every category like preferred vendor list, approved vendor list and master vendor List. 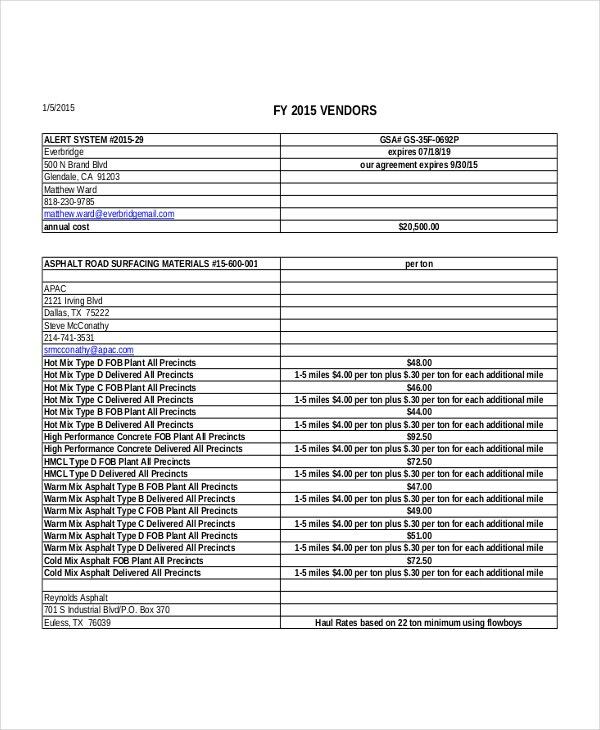 These templates enable you to prioritize your vendors and analyze the pattern of transactions in order to make sure that you can better strategize your business.